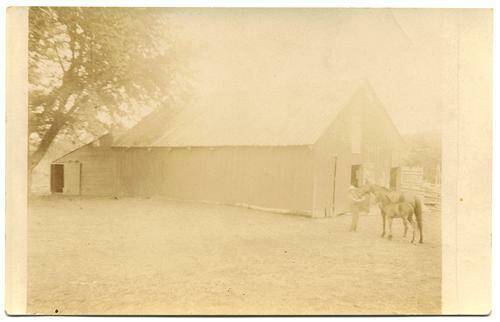 View of a barn; person with mare and foal nearby. Note on back: "How is this for the barn not as good as might be but the best I have got." Location is unknown; photo was found with other items from southeast Nebraska and northeast Kansas. Real Photo postcard, SOLIO (1903-20s). Minor corner tip wear. Shallow vertical crease near right edge.